A balloon-borne aerosol counter is a new tool that could help track the movement of volcanic ash clouds. To test this new device, a team of CNES balloon specialists travelled to Iceland to conduct a measurement campaign. 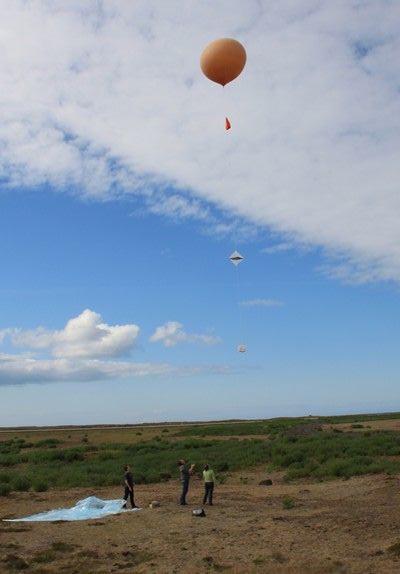 Release of the first balloon on 19 July in Keflavík, Iceland. Credits: CNES. In April 2010, Iceland’s Eyjafjöll volcano erupted, paralysing Europe’s air traffic for five days. “If we’d had more precise information about the concentration and dispersion of the volcanic ash, we wouldn’t have needed to ground all air traffic as a precautionary measure,” says Nicolas Verdier, head of tropospheric tracer balloons at CNES. In response, Jean Baptiste Renard’s team at the LPCEE environment and space physics and chemistry laboratory (1) and Environnement SA, an industrial company, formulated the idea to miniaturize an aerosol counter — designed to measure these tiny particles suspended in the atmosphere — and fly it on a sounding balloon to track ash clouds in real time. “Until now, this type of instrument has only been used for research purposes,” explains Nicolas Verdier. 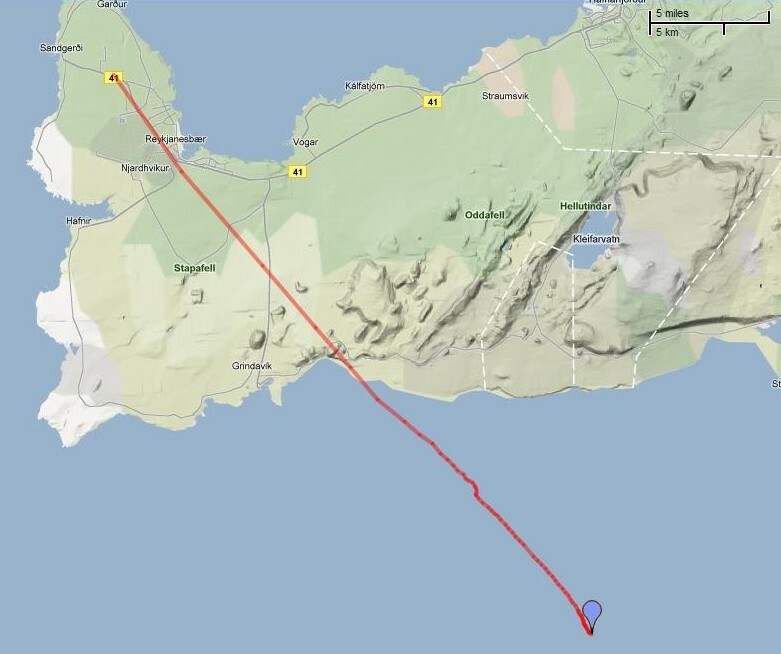 “But small devices, weighing about 400 grams, could be deployed systematically, each time a volcano erupts.” To test its effectiveness, an initial measurement campaign was organized in Iceland, near Reykjavík, from 18 to 24 July 2011, with the support of the Icelandic Meteorological Office (IMO). The tiny instruments, called LOACs (light optical aerosol counters), were installed on three balloons operated by the IMO. The results were positive, with aerosols detected throughout each balloon’s two-and-a-half-hour flight, at altitudes up to 30 kilometres. 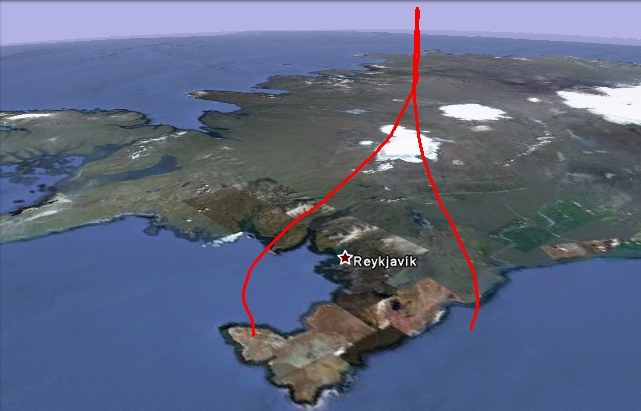 3D flight path of the first balloon, released in Iceland on 19 July. Credits: Google Earth. To make the tool useful for meteorologists, the next step is to further reduce the weight of the LOAC aerosol counter by a few dozen grams and test it on tropospheric balloons, designed for missions lasting several days. “We hope to fly this instrument on a superpressure boundary layer balloon (2) to track volcanic particles throughout the cloud’s entire journey in the atmosphere and in turn estimate how it will evolve with time,” continues Nicolas Verdier. 2D flight path of the second balloon, released on 20 July. Credits: Google Maps. In the meantime, the LOAC measurement instrument will be used to detect other types of naturally occurring and human-made aerosols. (2) Layer of the atmosphere directly influenced by Earth’s surface, from 0 to 1 km above ground level.